YORKSHIRE IS set to lose four MPs as part of a major shake-up of the way the region is represented at Westminster. Cutting the number of Commons seats for the region from 54 to 50 would involve changes to almost every constituency under plans put forward today by the Boundary Commission for England. Only three seats across Yorkshire - Beverley and Holderness, East Yorkshire and Elmet and Rothwell, would be unchanged by the proposals. Even among seats where the current name would remain there would be significant redrawing of boundaries ahead of the 2020 elction. Labour has already questioned the proposed changes arguing they will disproportionately benefit the Conservatives. On the Humber, the commission is proposing to cut the current 10 MPs to nine. There would be changes to the way Hull is represented with the Hull East name retained to be joined by Hull Central and a constituency known as Hull West and Haltemprice raising questions over the future of existing Hull West and Hessle MP Alan Johnson and Brexit Secretary David Davis, the Haltemprice and Howden MP. Brigg and Goole becomes Goole while on the south bank the current Great Grimsby and Cleethorpes constituencies would become Grimsby North and Barton and Grimsby South and Cleethorpes. 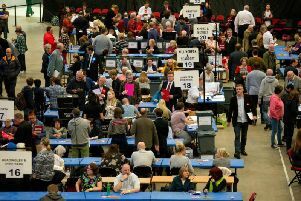 The remaining three seats to be cut would go from changes in North, West and South Yorkshire. Among the most striking changes would be the disappearance of the Penistone and Stocksbridge constituency currently held by Labour’s Angela Smith with two of the wards joining a new Sheffield Hallam and Stocksbridge constituency stretching all the way from Sheffield’s southern suburbs currently represented by former deputy prime minister Nick Clegg to villages west of Barnsley. Batley and Spen would become two constituencies rather than the current one as part of wider changes which would see the dissappearance of Bradford South. Morley and Outwood was the scene of one of the major shocks of last year’s General Election when sitting MP Ed Balls, shadow chancellor at the time, lost to the Conservatives’ Andrea Jenkyns. Under the Boundary Commission proposals Morley would join a new Batley and Morley constituency while Outwood would join Normanton and Castleford, the area currently represented by Yvette Cooper. Pontefract becomes a constituency while Hemsworth joins Barnsley East. In Leeds, the Leeds West constituency name disappears as part of a reshaping of the way the city is represented which includes a new-look Pudsey seat. The plans published today are initial proposals only and are set to be the subject of much debate before they are finalised ready for the 2020 General Election. Conservative Party chairman Patrick McLoughlin said: “Boundaries should be drawn up in an impartial and independent way so I welcome the Boundary Commission’s proposals to implement Parliament’s instruction to ensure equally-sized constituencies. Without these reforms, MPs could end up representing constituencies based on data that is over 20 years old. He added: “The Government must redo the process to acknowledge the huge surge in voting registration that has taken place over the past year.